My latest yarn purchase arrived in the mail this week. I realize my New Year's Knitting Resolution was to not buy new yarn but I actually bought this stuff back in December so I'm still OK on the resolution front. It arrived all the way from Uruguay in the smallest box imaginable. I don't know how they managed to shove it all in that one box. I bought this stuff on eBay after my good friend Bonnie had sent me a link to this seller's store. It seems that since Bonnie broke her wrist and couldn't knit for awhile she spent way more time surfing the knitting blogs and that is how she got me in to trouble. She kept sending me links of cool yarn and I'm clearly way to impressionable. She didn't seem to end up buying any but I did! First I bought three skeins of hand dyed yarn from Scout and then I bought these. This is 9 - yes NINE skeins of wool from Uruguay! What was I thinking??? 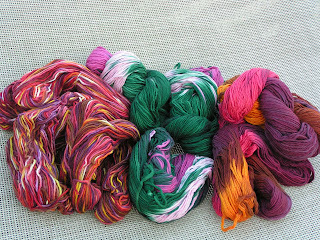 Each skein is over 200 yards so now I have about 650 yards each in three different colorways of Uruguaian wool. What should I make with this stuff? I will say that t is very soft and the colors are quite pretty. It was a good buy too - really it was. Bad Bonnie, Bad Bonnie. I think that's why her initials are BAD! It looks perfect for felted bags. Please send me the ebay seller names. What great colors. Just hang it up and admire it! I purchased 14 skeins from this same seller almost a year and a half ago....so like Malabrigo, but with different colors. I had planned to make a felted vest for a friend...but the endless rounds of stockinette really got to me. Very pretty yarn. At least you bought enough so I don't think it will be too hard to find something to knit. 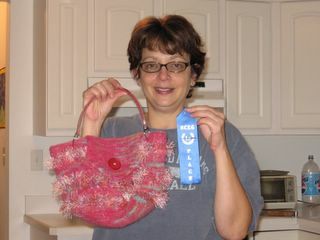 I know I have the fiber trends felted clog pattern on my knit to do list. I was shocked to find out just how much yarn that pattern takes. Too bad I have such big feet. Gotta LOVE friends like Bonnie :-)!! I can't wait to see photos of all the fun projects you'll make with your new yarn!! Where the knitting speaks for itself - well actually I may do some talking too! I'm the mother of three wonderful kids, work full time as an attorney and whenever I can sneak a few minutes to myself I knit or take photos. I love reading your comments on my blogs so please comment away.